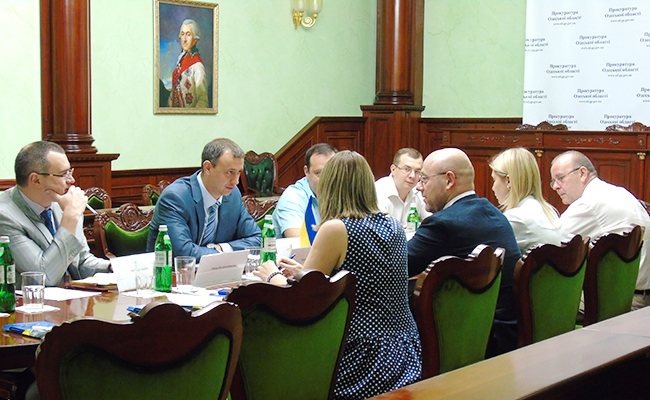 European Union Advisory Mission representatives visited Odessa at the end of July. The purpose of the visit was to build relationships with a broad range of local partners across the civil security sector. The EUAM delegation was headed by deputy head of mission Hugues Fantou, alongside Udo Moller, head of regional outreach, and a delegation of regional outreach representatives and advisors. Borys Magazinnik, chief of staff for Odessa regional police, expressed his interest in the model police project currently being conducted in Sambir police office. This is a joint project between EUAM and Lviv regional police, under the guidance of the ministry of the interior. Magazinnik proposed cooperation on an equivalent experiment in Odessa, pending approval from the ministry of the interior. He underlined the need to bring police closer to European practices in enhancing public safety. Deputy chief of Odessa regional police Sergiy Kalyuk updated the EUAM team on the current state of the ‘safer city’ project. He also announced the start of the Odessa patrol police project, slated for 29th August, which will follow the model already in operation in Kyiv. Kalyuk then confirmed the launch of a new IT system for the dispatch centre. Further discussions with Roman Lyshkovyat, head of dispatch for Odessa city police, centred on improving police dispatch and response to calls, alongside processing of information from an incident. The EUAM delegation also met with Roman Govda, chief public prosecutor for Odessa, to discuss implementation of the new law entitled; ‘on public prosecutor’s office’. Both parties worked towards improving liaison and future co-operation in pushing public prosecutor reform, alongside improving public visibility. Govda further proposed EUAM observe the recruitment process to the positions at the local public prosecutor’s offices. EUAM met with the consultative council at the Odessa prosecutor’s office, which is a civil society engagement mechanism in the work of the prosecutors. EUAM held meetings with Andriy Tolopilo, the ombudsman representative in Odessa, and representatives of non-governmental organisations. Civil society activists updated the EUAM team on establishing an anti-corruption council under the new Governor administration. All interlocutors stressed their will to enhance cooperation with EUAM and to meet on regular basis.